As the date of the MTA’s board-oriented board meeting draws closer, details of the 2011 fare hike proposal are beginning to emerge. Yesterday, we heard how unlimited cards will become limited, and today, we know more about the authority’s plans for single-ride and pay-per-ride users. According to The Daily News, the MTA is going to raise the fares for the single-ride paper tickets from $2.25 to $2.50 and will drop the pay-per-ride discount from 15 percent to 10 percent. According to Pete Donohue, this plan is apparently designed to have a smaller impact than the unlimited-ride increases. 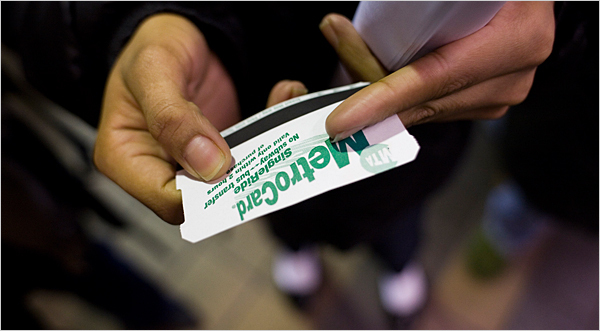 Only 2.1 percent of subway riders use the one-way paper tickets, and the base fare would remain $2.25 for pay-per-ride card users and those paying for bus rides in coins. The 10 percent fare discount will impact the 36 percent of riders who use the pay-per-ride cards, and instead of getting 10.35 rides for the price of nine, these riders will now get 11 rides for the price of 10. The average cost per swipe will increase by approximately four percent from $1.96 to $2.05. For the MTA, their overall goal is a 7.5 percent fare hike, and unlimited card users are going to be hit the worst. In reality, the average fare across all payment systems remains lower than it did in 1996, and the authority is trying to at least keep pace with inflation. Come January, we’ll all be paying more for our subway rides with less service than we had three weeks ago. Better start stocking up on MetroCards while they have that 15% bonus. I wish I understood why the MTA insisted on keeping the base fare at $2.25. They should raise the base fare and increase the bonus so the net cost is the same, while they can capture more money from people dumb enough not to buy pay per ride cards. How about a $2.75 fare with a 35% bonus, or a $3 fare with a 45% bonus.? Most riders do not use the MTA anywhere near as much as you do. You’re suggesting that the MTA charge most users more money to subsidize your already super cheap fare. Ben, you’re contradicting yourself. If the base fare rises to $2.50 and the pay-per-ride discount drops to 10%, then the fare per swipe goes up to $2.25, not $2.05. My own feelings about such a plan are conflicted. On the one hand, decreasing the unlimited monthly to pay-per-ride fare ratio is a good thing. On the other hand, if the ratio is not decreased much, then the decrease in the pay-per-ride bonus could instead get people to switch from pay-per-rides to single-rides. From the points of view of minimizing the number of TVMs required and minimizing the number of fare transactions, this may backfire. I think we should refer to it as a bonus, not a discount. Discount implies you get 10% off, while a bonus implies you get 10% more which is what really happens. If the current 15% was a discount then the cost/ride would be $1.91 instead of $196. And under the new plan the cost would be $2.03 instead of $2.05. I still don’t understand. If the base fare is $2.25, then why is a single-ride card $2.50? As a premium for using a TVM for each ride, using paper for each ride, and for not giving the MTA any extra money upfront. Septa in Philadelphia charges $1.55/token, but the tokens must be bought in packs of at least two. If you pay cash the fare is $2. It’s the same concept here. And I will admit, I’ve paid that $2 cash charge when I knew I was only making one trip and would not be using Septa again for months or years. I knew I was paying an extra $.45 but I didn’t need the bulk and would likely lose that extra token so buying two tokens would have cost me an extra $1.1. So instead I paid Septa an extra $.45. The MTA would like to collect the extra $.25 in similar situation. I think it’s a great idea and my only complaint is that they’re only charging an extra $.25 and not charging it for coins on buses. Ah… so what the MTA is saying is that a single-ride costs $2.50, and a pay-per ride costs $2.25 if you refill one at a time and $2.05 if you refill in bulk? I think the reason would be if a person puts in a MetroCard for part of the fare and coins for the other part of the fare, do you charge them the MetroCard fare or the SingleRide fare? That’s crazy to charge $ 2.50 for a single ride paper ticket and the base fare staying at $ 2.25, because there’s a lot of empty or leftover change on metrocards being throw away and anyone can just pick one of those metrocards and refill it and use it. I pick up and check mtrocards everyday at subway stations or select bus service stops and i have been finding a lot of metrocards that have a balance on it and it’s been helping me pay my fares saving me alot of money on public transortation. Single rides really make very little sense. It means stopping to buy a card every time you get on the subway and never taking a bus. The only people who should be using single rides are tourists who don’t know if they will be taking another trip, or people who only take a single trip once a month. For those users there should be a premium, $.25 feels about right, but I wouldn’t be opposed to more. I agree with Alon that the unlimited/pay-per-ride ratio should return to 35-40, that way more people will have unlimited cards and only use the TVMs once a month. But even with that, the 90 cap I think is fair. Maybe you could argue that it should be more like 100-120, but the point is those outliers are already getting such an insanely great deal they should be paying more for the privilege. I tire of being asked to pay more for subway service when in fact subway riders make it possible for drivers to use the free bridges and roads. The MTA riders should should drive to work one day every month enmasse and clog the roads just to make this point clear. In many other cities, subways use distance-based fares. ($2.25 from Brooklyn to the Bronx is definitely a steal.) It’s unfortunate that NYC’s interesting social distribution makes that impossible. Paris has the same social distribution as New York; the RER still has distance-based fares.